Learn about crested gecko habitat setups, crested gecko terrarium setup and proper crested gecko care and housing. 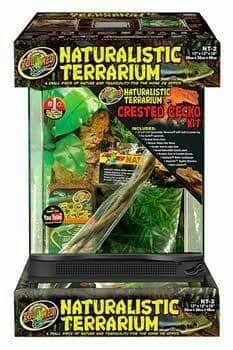 Before purchasing your new crested gecko for sale, explore proper crested gecko habitat preparation and provide your new pet crested geckos for sale the best crested gecko terrarium or crested gecko possible. Baby crested geckos are best housed in large plastic terrariums or in standard (20-inch) 10-gallon reptile tanks with a screen top. An adult crested gecko should be housed in a 20-gallon tank with screen top. Larger tanks will allow for better displays. In areas with moderate to high relative humidity, crested geckos will fare well in screen cages. These tanks have the advantage of being light and easy to clean. You can keep one male and several female crested geckos together. Male crested geckos may fight, particularly when in the company of females, and should not be kept together. Cresteds like all reptiles, are ectotherms (body temperature varies with environmental temperature), so it is important that you provide the proper temperature range (thermal gradient) for activity and feeding. A thermometer is essential for accurate temperature measurements. Crested geckos are comfortable at temperatures in the range of 78 to 82 degrees F during the day with lows in the 70s at night. In most areas this temperature range will be reached during the warm months of the year without additional heat. In summer, place crested geckos in a cool room if the temperature exceeds 87 degrees. During the winter crested geckos will tolerate night drops into the 60s just do not drop below 60 Degrees F at night. The easiest way to provide heat is a ceramic heat emitter in a reflector type fixture placed on the screen top over one side of the tank so that the temperature of basking areas (branches) reaches the desired range. You can also provide under terrarium heat with a pad but the vertical design of proper habitat would make it so that is less effective. You must always keep one side of the tank unheated so that crested geckos can choose a cooler area to regulate their body temperature. The use of a subtank reptile heat pad or heat tape under one side of the tank can be regulated by a thermostat. If you have live plants in your vivarium additional light can be provided by a fluorescent bulb running the length of the tank. Crested geckos tend to rest in foliage or shelters during the day and are active at night. They do not require UVB light if fed a diet that contains Vitamin D3. Turn off lights at night. Crested geckos spend most of their time above ground so a variety of substrates can be used. For simple maintenance purposes, reptile carpet is attractive and easily cleaned. For a more naturalistic look, a peat-moss-based soil mix that doesn’t contain perlite will work well. Coir (coconut fiber pulp now sold in reptile stores as compressed bricks) mixed 50 percent with soil is a good choice for growing live plants. Crested geckos feel comfortable resting in foliage and like to climb on wood. Good landscape materials include cork bark sections for vertical and ground level shelters and climbing areas. Dried wood branches angled across the length of a vivarium provide resting and activity areas. Do not over clutter the tank. Leave plenty of open space. Live or artificial plants in combination with wood and bark will provide the security crested geckos need to rest in the open and add a decorative element to the display. Good plant selections include small Ficus benjamina, Dracaena spp. and Pothos. In this author’s opinion, the complete powdered diet Pangea brand “Crested Gecko” Diet has played a key role in making these among the most popular of lizards kept as pets, because it excludes the need to feed live insects. Crested geckos thrive when fed this diet exclusively, which has been tested with thousands of geckos for more than 10 years. The diet is mixed with two parts water and offered in shallow dishes three times a week as much as these geckos will eat at a feeding. The diet is allowed to remain 24 to 36 hours before removal. In addition to fruit, crested geckos relish insects and some hobbyists choose to offer these as either a primary diet or as supplementary diet. Crickets now sold in the pet trade are the best choice and you should select a size where length of cricket equals width of head. Crickets should be lightly coated with a vitamin/mineral supplement that contains calcium, vitamin D3 and a complement of other essential vitamins and minerals. They should be offered three times a week as a primary diet or once a week as a treat/supplement to the Crested Gecko Diet. Water should always be available for crested geckos in a shallow water dish. These geckos also require a relative humidity of at least 50 percent and preferably 70 percent. In dry areas the tanks should be lightly misted nightly or a cool air humidifier placed in the room. Inexpensive hygrometers (relative humidity gauges) for use with reptiles are now readily available in the pet trade. In nature, crested geckos will usually lose their tails and end up with a tiny pointed tail nub. “Taillessness” is a normal condition for adults crested geckos. In captivity, hobbyists like their crested geckos with tails, but this requires keeping animals individually and pampered to prevent tail loss. Even then it happens, oh well 🙁 They are still super cute! Newly purchased crested geckos should not be handled, but first allowed to settle in for three to four weeks to let them adjust to their new environment and to make sure they regularly feed. When you start handling your crested gecko, make handling sessions short, no more than five minutes. Baby crested geckos tend to be flighty and can be injured in the course of handling. For this reason you should wait until they are at least 3 inches SVL before handling. Crested geckos seldom bite and when they do it is of little consequence. A quick nip and let go.